We normally think of pollinators as providing a valuable service to plants, and they certainly do. In exchange for nectar, pollinators like the well-known honey bee carry pollen from one plant to the other and thus promote cross-fertilization. But what happens when the pollinators aren't satisfied with their nectar rewards and decide to eat their generous plant partners? Just such a scenario arises in a number of plant-pollinator mutualisms in which the pollinator deposits eggs on the plant, which then develop into herbivorous larvae. What is a plant to do when faced with such a dilemma? 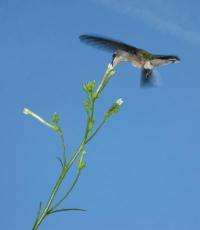 As reported online on January 21st in Current Biology, a Cell Press publication, Ian Baldwin and colleagues have discovered an ingenious solution to this problem by studying the pollination of a wild tobacco species living in the Southwestern United States. This tobacco plant, Nicotiana attenuata, normally opens its flowers at night, during which it is visited, and pollinated, by the night-active hawkmoth. In exchange for transferring pollen, the hawkmoth is provided with a sugary reward. Such a quid pro quo relationship would seem to be all fine and dandy for N. attenuata, but as it turns out, the hawkmoth also likes to lay its eggs on the plant—eggs that develop into voracious, leaf-eating caterpillars. This is obviously not an ideal outcome from the plant's perspective. But N. attenuata has an interesting trick up its sleeve. Stimulated by oral secretions released by the munching caterpillars, N. attenuata performs an astonishing change in flower phenology (the timing of flower opening) in which the flowers open in the morning instead of at night. This change in flower phenology, as well as other alterations, including a metamorphosis in flower shape and the loss of key chemical attractants, leads to a switch in pollinators from the hawkmoth to a local hummingbird. The latter, unlike the hawkmoth, is normally active during the day and seems to be satisfied with just a nectar treat. Of course, these observations raise the question of why N. attenuata bothers producing night-opening flowers that attract hawkmoths in the first place. Why not just focus on luring hummingbirds? Baldwin and colleagues don't know the answer to this question, but it's possible that the hawkmoth, for all its faults, might be a more reliable and effective pollinator than the hummingbird. Looking to the field of plant-pollinator interactions more generally, the findings have some potentially broad implications. For one, plants face another dilemma, related to the one described by Baldwin and colleagues, in which traits that attract a pollinator can also attract herbivores, resulting in an inevitable trade-off. Thus, one wonders whether herbivore-induced changes to flower phenology could be used more generally to mitigate the unwanted side effects associated with flowers that are attractive to both pollinators and herbivores. Also, in studying how the caterpillars' oral secretions induce the switch in flower phenology, Baldwin and colleagues discovered that a chemical pathway crucial to many defense responses in plants is required. The role of such a common defense pathway raises the interesting possibility that the effects of herbivore attack described in the study may be common in plants. Taken as a whole, the findings highlight the remarkable adaptability of plants to changing circumstances and the complex, sometimes contentious, relationships between plants and their pollinators.